During the last year of the Master's program you will have the unique opportunity to work on exciting research topics. During this so-called research phase, you can choose from an extensive number of research groups and current projects. 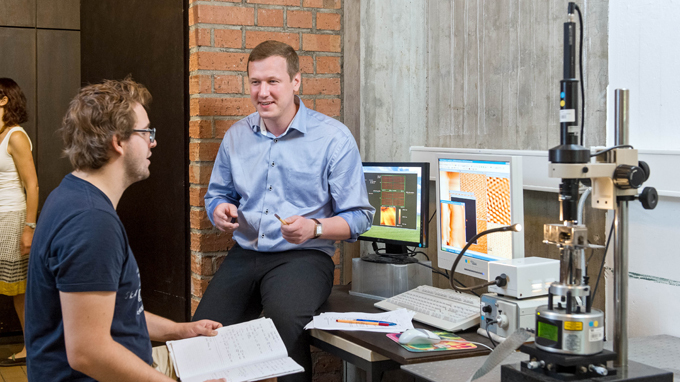 Aliaksandr Bandarenka and a Master's student in his group discuss about their research. Foto: TUM.PH/Eckert. The research phase constitutes one thematic block, culminating in the dissertation of the Master's thesis. To the scope of the one year research phase (60 ECTS) belong firstly, the development of the necessary special knowledge within a cutting-edge research line and secondly, the acquisition of the corresponding experimental or theoretical skills, that are necessary for the realization of the research project within the frame of the Master's thesis. Each of these steps conforms a module, the Master's seminar and the Master's training. Both modules belong intrinsically together and account in total for 25 ECTS. Subsequently, the independent research project can be carried out as part of the Master's thesis, which corresponding module comprises 30 ECTS. The research phase is completed with the Master's colloquium, the defense of the Master's thesis, for which 5 ECTS are given. During the research phase, the fulfilment of an independent scientific work is tighly connected with the acquisition of additional skills, such as project management, team work as well as the depiction and presentation of scientific results. Students have to take contact by their own with the working groups and potential supervisors, in oder to agree on a topic for the research phase/master thesis. Additionally to this, supervisors have the option to announce topics in the section below (supervisors see "Access for supervisors" on the right). However this possibility is not used by all institutes and not all topics are listed. Therefore it is recommended to ask the professors or in the institutes for topics. Furthermore, it is recommended to start early (at least one semester in advance) to search for an appropriate topic. Having face-to-face interaction with the group, you can see if you like the topic and if you feel comfortable in the group (you will be working one year there!). We discourage you from simple e-mail exchange, as it is usually not successful. constants (pKa values) or modeling other electrochemical processes using implicit solvation models. The goal of this M.Sc. project is to introduce a better description that accounts for the orientational behaviour of solvent modecules, based on findings from previous extensive Molecular Dynamics simulations. The student will learn how to perform DFT calculations using implicit solvation and, in a second step, will compute the interaction of the interfacial water structure with the electric field obtained from these simulations. Basic knowledge of UNIX based operating systems and some experience with programming (and/or scripting) languages (preferably Python) is desirable, but not mandatory. This Thesis is based on Deep Neural Networks (DNN) applied to generate new organic semiconductor (OS) molecules. Deep learning models project input data through several layers of nonlinearity and learn different levels of abstraction generating a link between the inputs and specific target outputs (or labels). Recently, there has been a fundamental work about using DNN algorithms for synthesising in-silico new OS  grounded on the seminal work by Gomez-Bombarelli et al. and Kusner et al. on the Grammar Variational AutoEncoders (GVAE) method. The thesis is focused on implementing a GVAE and further developing the method to include bigger molecules. The DNN will be applied to some realistic OS in order to evaluate the efficiency and accuracy in generating new molecules. Für das kommende JUNO (Jiangmen Underground Neutrino Observatory) Neutrinoexperiment werden in Garching möglichst empfindliche Radonmonitore für gasförmige Luft und N2 konzipiert und entwickelt. Im Rahmen dieser MSc-Arbeit soll ein neuartiges Konzept, das auf den Szintillationseigenschaften von gasförmigen N2 beruht, weiter entwickelt und ein Prototyp zur Messung der Radonkonzentration in Luft und N2 aufgebaut und charakterisiert werden. Fuer die Myondetektoren der Experimente am Large Hadron Collider (LHC) und an zukuenftigen hochenergetischen Proton-Collidern werden Gasdetektoren benoetigt, die auch bei sehr hohen Unter-grundzaehlraten hohe Ortsaufloesung und Myonnachweiswahr-scheinlichkeit liefern. Fuer die im Bau befindlichen Myonkammern wird neue Ausleselektronik benoetigt, die maximale Ratenfaehig-keit erlaubt. Hierzu werden neue Verfahren zur schnellen Pulsformung im Labor und im Teststrahl am CERN untersucht. Parallel dazu werden die Schaltungen als ASIC Chips realisiert und getestet. Zur Verbesserung der Effizienz des Myontriggersystems des ATLAS-Detektors am Large Hadron Collider (LHC) werden neue schnelle Triggerdetektoren (Resistive Plate Chambers) gebaut, die sehr hohe Untergrundzaehlraten aushalten und hoehere Lebensdauer und Zeitaufloesung als bisher aufweisen. Die Eigenschaften dieser Detektoren werden in vorhandenen Testaufbauten und im Teststrahl am CERN systematisch untersucht. The smaller a device is, the higher its resonance frequency becomes. For our future quantum optomechanics experiments we will be working with mechanical resonators that operate at GHz frequencies and simultaneously couple strongly to light. Using mechanical and optical band structure calculations, you will design, make, and measure phononic and photonic cavities. The project involves nanofabrication in the cleanroom, as well as using the extreme sensitivity offered by on-chip optomechanics. We are aiming for devices made from silicon nitride, which has a lot of tensile stress in it. For micromechanical structures this material gives much better mechanical properties compared to, for example, silicon devices. An important aspect of the project is to understand if this is also true for the high frequency devices. The computational design of new materials for heterogeneous catalysis relies on methods that can accurately predict adsorption energies of reactants and intermediates at low computational cost. Quantum-mechanical calculations based on the Density Functional Theory (DFT) are typically used for surface reactivity studies, but their cost significantly limits the number of compounds that can be evaluated as candidates for catalysing each targeted reaction. Scaling relations between adsorption energies of similar adsorbates and machine-learning approaches have been recently developed to circumvent this computational burden, but their application is currently limited to extended close-packed metal surfaces. Real catalysts are typically formed by supported metal nanoparticles exposing sites at different facets, edges, and corners. Dealing only with extended surfaces thus limits the predictive potential of computational catalyst design. The goal of this M.Sc. project is to extend existing approaches for predicting adsorption energies to the description of undercoordinated sites typically found on metal nanoparticles. The candidate should be interested in electronic structure and machine learning methods, as well as in surface chemistry and catalysis. The student will learn how to perform DFT-based calculations and to use and asses the results of different machine learning methods. Basic knowledge of UNIX based operating systems and some experience with programming (and/or scripting) languages (preferably Python) is desirable, but not required. Questions about the project can be directed to mie.andersen@ch.tum.de and albert.bruix@ch.tum.de. Organic photovoltaic (OPV) technology has seen a rapid evolution over the last decade. The unique selling points of OPVs, such as excellent light harvesting capability, freedom of form, color and transparency, environmental friendliness, easy scalability and lower manufacturing costs based on roll-to-roll printing methods, position this technology for the mobile power market, and this most properly reflects the state of the art in commercialization. An important milestone towards OPV commercialization has been surpassed by reaching a power conversion efficiency (PCE) of up to 17%. The main limitation in OPVs is due to the intrinsic narrow absorption window (~100-200 nm) of polymers compared to inorganic semiconductors such as Si, which makes it challenging to fully cover the solar spectrum with a single junction device. To overcome the absorption limitation, ternary blend organic solar cells represent one of the dominant strategies that has been explored in the last decade. The outstanding advantage of ternary blends consists of maintaining the simplicity of the processing conditions used for single active layer devices. Interestingly, the open circuit voltage (Voc) is tunable depending on the loading concentration of the ternary compound in both ternary systems compromised of i) two donors and one accepter as well as ii) one donor – two accepters blends. The origin of the composition-tunability of Voc and the optimal electronic correlations between the components remains as an open question in OPV field. Obviously, it is very challenging to develop a complete model for Voc in ternary systems mainly due to the fact that this model should take all the electronic interactions between the components into account and consider their role in the photogeneration. Moreover, the model should be compositional dependent and accounts for the different microstructures and transport mechanisms operating simultaneously in the system. To this end, a semi-empirical method is required to link the electrical characteristics of ternaries to their morphological properties and draw a comprehensive picture from the morphology models reported in literature as the origin of Voc changes in ternary systems. This project will focus on solving the aforementioned key challenge by employing a semi-emprical method based on kinetic Monte Carlo (kMC). An existing lattice kinetic Monte Carlo model, previously applied to the modeling of binary polymer:fullerrene solar cells, will be extended to treat ternary blends. This will allow us to correlate nano-morphological features with measured optical properties and obtained Voc, a crucial capability for the design of optimized, high performance ternary solar cells. In most experiments pure spin currents are generated and/or detected via the spin Hall and inverse spin Hall effect in heavy metals. These two effects crucial depend on the magnitude of the spin-orbit interaction. The goal of this thesis is to investigate spin Hall effects physics in oxide systems, where also large spin orbit interaction is prevailing like the transition metal oxides. Especially, the realization of epitaxial multilayers of a spin Hall active material and an oxide magnetically ordered insulator are a major task of this research project. Such epitaxial structures are of current interest to better understand the underlying physics of pure spin current transports in these heterostrcutures. We are looking for an enthusiastic master student to work on this pure spin current physics related project. A crucial part of the thesis is the growth of oxide multilayers using laser-MBE under in-situ growth monitoring. The properties of these multilayers will then be investigated by structural, magnetic and magnetotransport techniques. As a next step, the tunability of relevant spin transport properties via the growth conditions will be analyzed. Der Large Hadron Collider (LHC) bietet eine einzigartige Gelegenheit, nach Teilchen der Dunklen Materie zu suchen. Sie machen sich im Detektor durch sogenannte fehlende Energie bemerkbar. Zusaetzlich muessen jedoch bekannte Teilchen als Signal erzeugt werden. Dafuer eignen sich besonders gut Hadronjets, die durch Gluonabstrahlung im Anfangszustand haeufig erzeugt werden, aber auch Eichbosonen und sogar das Higgs-Boson. Die Auswahlkriterien fuer solche Ereignisse werden mit Hilfe simulierter Daten optimiert. Viele Erweiterungen des Standardmodells sagen neue schwere Resonanzen voraus, die in Eichbosonpaare, ZZ, WW, WZ zerfallen. Mit Hilfe simulierter Daten werden die Selektionskriterien fuer diese Zerfaelle optimiert und die Nachweissignifikanzen bestimmt. Die Ergebnisse werden auf die neuesten Daten des ATLAS-Experiments bei der bisher hoechsten Proton-Proton-Kollisions- Energie von 13 TeV bestimmt. The recent detection of gravitational waves (GW) with the advanced LIGO/Virgo instruments in conjunction with a short gamma-ray burst (GRB) has surprised gamma-ray astronomers because of the substantially different properties of the GRB signal as compared to canonical GRBs. This motivates an "open-mind" search for untriggered transient events in the data stream of the gamma-ray burst monitor (GBM) on the Fermi satellite. With two previous Bachelor theses we have developed a physical background model, paving the way for automated searches, and subsequent source and background fitting. This thesis shall be devoted to establishing a Python program for identifying long-term (> few minutes) transients in Fermi/GBM data, localizing them on the sky, and deriving basic properties (spectrum, light curve). The project includes elements from computational and observational high-energy astrophysics, and will allow for obtaining extensive knowledge on the broad class of high-energy transients. Some background in astrophysics is advantegeous, but affinity with Python programming is a must. The combination of ferromagnetic and superconducting materials leads to intriguing proximity effects at the interface of the two materials. The goal of this thesis is to study the spin current transport across superconductor/ferromagnet interfaces and investigate the feasibility of different spin current injection schemes for this task. To this end, we will use spin pumping and tunnel junctions to inject a spin current into the superconductor. From these studies we want to identify the role of quasiparticle transport for the flow of a spin current in the superconductor. Especially close to the critical temperature large contributions from these excitations is theoretically expected. For the superconductor/ferromagnet tunnel junctions, the magnetic field orientation dependence and its influence on the Andreev reflection contribution is the focus of this study. We are looking for a motivated master student to investigate spin current transport in superconductor/ferromagnet heterostructures. The thesis deals with the fabrication of these heterostructures using our new UHV sputtering system and structuring of the blanket films with optical lithography. In addition, characterization of theses heterostructures at low temperatures will be conducted in superconducting magnet cryostats. Here, high frequency spin dynamics as well tunneling spectroscopy will be conducted. Semiempirical electronic structure approaches like the density functional tight-binding (DFTB) method are popular due to their unrivaled computational efficiency. This often makes them the only option, e.g. for describing the electronic structure of nanoparticles, which may consist of tens of thousands of atoms. Their efficiency comes at the cost of limited accuracy and transferability, however. Currently, these shortcomings are compensated on a case-by-case basis by the introduction of empirical parameters. Unfortunately, even here the limitations of the underlying theory sometimes become evident. The goal of this M.Sc. project is the development of a novel framework for a tight-binding-like theory that goes beyond the typical two-center approximation for the Hamiltonian. The candidate should be interested learning the fundamentals of electronic structure theory, implementing methods and performing numerical test of different approximations. The main focus of the work will be on programming. Experience with a scripting language (e.g. Python) is advantageous but not mandatory. Questions about the project can be directed to johannes.margraf@ch.tum.de. The registration to all modules belonging to the research phase is done at once in the Dean's Office (Dekanat), normally at the beginning of the third Master's semester. When doing this, the certificate of mentor counseling has to be included. After agreeing on a topic with the future supervisor, students can print out the registration form in the student access. After six months the Master's thesis should begin. Passing the Master's seminar and the Master's training will be recorded in TUMonline and you are officially alowed to start the thesis. Before handing in the Master's thesis, you must fill in the final titel of the thesis in the database (student access) and upload an electronic copy (PDF-file). Afterwards, you have to hand in two printed versions in the Dean's Office (Dekanat). You have to hand in the thesis at the latest on the deadline, please keep this on mind. Extension of the deadline is only possible for good reasons. See FAQ on Thesis extension. The Master's thesis will be evaluated by the supervisor and a second examiner. The second examiner is appointed by the examination board on suggestion of the supervisor (after official registration of Master’s thesis). The supervisor and the second examiner will also grade the Master's colloquium, which completes the research phase. With a due date for your thesis e.g. in October, you should not forget to re-enroll for the winter semester and the corresponding deadline would be August 15. The Master’s colloquium is organised and conducted by the supervisor together with the second examiner. The Master’s colloquium takes approximately 60 minutes, consisting of a 30 minutes talk and 30 minutes examination. Naturally, the inclusion of the colloquium in a group seminar is possible. At the end of the semester in which you reach the necessary 120 ECTS in your Master's degree program you will be exmatriculated (according to §13(1) enrolment rules of TUM). In most cases the Master's colloquium will be the last exam to reach this point. You are principally allowed to take further exams after reaching the 120 ECTS, i.e. to replace previous results in the catalog of special courses or non-physics courses with better results. Therefore it is generally not possible that the final documents are generated before you are exmatriculated. In case you need the final documents (or even preliminary documents) earlier, you have to request for it explicitly. See the Remarks on end of studies and final documents for further information. The final grade is the ECTS-weighted average of the graded exams, which are used to fulfill the 120 ECTS. These are the compulsory optional subject in theoretical physics, the special courses, the non-physics courses, the Master's thesis and colloquium. If you have taken more than 30 ECTS in the special courses or more than 8 ECTS in the non-physics elective courses, then TUMonline will try to find the combination, which results in the best final grade. Redundant courses will be listed as "additional courses" in your transcript. If you want a different combination than the one TUMonline is suggesting, please contact the coordinator of the Master's degree program before the final documents are printed. The legal basis for the study program is given by the academic regulations. The EWC offers you free one-to-one consulting in English writing. They help you develop long-term proficiency in English writing, while polishing your actual texts in the process. Check out their Thesis Writing Program!